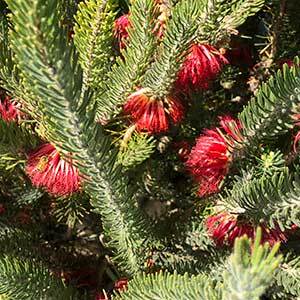 Also known as the one side bottlebrush, Calothamnus quadrifidus is a red flowering species. 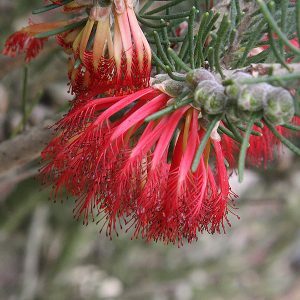 Winter to spring flowering, it attracts honey eaters to the garden and grows well in full sun to a little shade. The flowers appear along the stem and are very attractive. After the flowers fade it will produce seed pods which last for long periods on the stems. This is a species from Western Australia and it requires a very well drained soil to survive. Once established it is drought tolerant plant and you will find both upright and prostrate forms. Growing well in poor coastal soils, it flowers on old stems. It can be tip pruned after flowering to help maintain a more compact shape. One of the more forgiving plants from Western Australia, this is a plant that copes with some humidity. You will need a frost free position for best results. A position in full sun to a little light shade and a very well drained soil are essential. An annual application of compost will be about all the additional nutrients the plant needs except in very poor soils where a light application of native plant fertiliser may be beneficial. Use this in the garden border, as a feature plant for the beautiful flowers, or mass plant as low hedge. Propagation is from seed which can be collected and then plated out spring. Flowering Time – Mainly in spring summer.